A full-coverage wetsuit designed specifically for rescue crews. 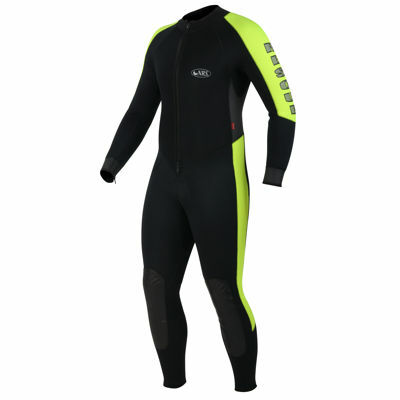 The NRS Rescue Wetsuit provides a high level of insulation, while retaining mobility. 3-mm neoprene with Titanium gives you superior heat retention and protection from the cold. 3-mm PowerSpan� neoprene panels in the shoulders, back and arms greatly increases mobility and reduces binding. Full length double-pull YKK� front zipper along with wrist and ankle zippers make this suit easy to get in and out of. Glued and blind-stitched the seams for maximum warmth and comfort against your skin. Molded polyurethane knees and shins provide long wear and extra protection. The 5-mm neoprene seat provides extra padding and it's covered with ToughTex� for increased durability. Textured raw neoprene friction zones on the sides help lock a PFD in place.